Clannad is a Grammy Award-winning Irish musical group, formed by several sisters and brothers of Enya. Their music has been variously described as bordering on folk and folk rock, Irish and New Age. They are known for performing in various languages, including English, Latin, Gàidhlig, Mohican and most of all in their native tongue, Irish. 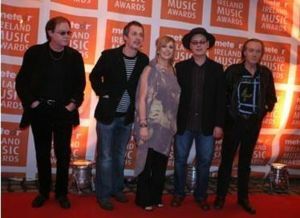 Clannad at the Ireland Music Awards. The Clannad members are Moya Brennan (born Máire Ní Bhraonáin), Ciarán Brennan (born Ciarán Ó Braonáin), Pól Brennan (born Pól Ó Braonáin), Noel Duggan (born Noel Ó Dúgáin) and Pádraig Duggan (born Pádraig Ó Dúgáin). Clannad first made their mark in the folk and traditional scene in the 1970s in Ireland and Europe, they subsequently went on to bridge the gap between traditional celtic music and pop music in the 1980s and 1990s. During their successful career they toured the world extensively and gained fans in every major territory. Lead singer Moya Brennan and her sister Enya have also enjoyed huge success as solo artists. The band won a Grammy Award in 1997 for Best New Age Album, and their record sales exceed the 15 million mark. They are also regarded as the band which, for the first time, put Irish traditional music and the Irish language on the world stage and paved the way for many other Irish artists. The name "Clannad" comes from Clann As Dobhar, meaning "the family from Dore". After ten years disbanded, the five original members of Clannad reunited onstage at the Celtic Connections Festival in February 2007 in Glasgow. They expressed their wishes to release a new studio album, but no official announcements have been made as of yet. Moya, Ciarán, Noel and Pádraig embarked on their first UK tour in over 10 years in the Spring of 2008, starting in Gateshead and ending in Liverpool on March 14. The first album was recorded in 1973, simply called Clannad (or The Pretty Maid) and showed a band aware of contemporary Irish music of the day. There were hints of modern influences, showing the band's ability to form contemporary, jazz influenced versions of traditional material. The second album followed in 1975. Produced by Planxty and Bothy Band founder Dónal Lunny, it showed a tremendously more mature band that was quite committed to singing mainly in Irish. The following year they produced Dúlamán, which probably was the high point of their albums of solely traditional material. The title track was a song about two dúlamán, or seaweed merchants, one of whom is trying to win the hand of the other's beautiful daughter. It has been a favourite of Clannad's live shows for a very long time. The band's next album was Crann Úll (Irish for "apple tree") released in 1978. It featured a stronger emphasis on Máire's harp-playing. On "Gathering Mushrooms" they included their sister Eithne Ní Bhraonáin (Enya herserlf) supporting vocals. In 1981 with the album Fuaim (pronounced "foom", meaning sound), Clannad began to experiment with a more lush and electric sound. Enya became, for a short time, a full member of the band, adding keyboards and harmony vocals as well as lead vocals on two songs, "An Túll" and "Buaireadh an Phósta". This album marked Clannad's first experiments with synthesizer. The following year Enya left to pursue her solo career. Clannad were signed up to RCA Records when they were approached and asked if they would be interested in doing a song for a fictional drama on British television, depicting the Troubles in Northern Ireland. Ciarán, Pól and Máire got together and wrote the now-legendary song "Theme From Harry's Game". Entering the British charts at number 5, it remains the only hit single in the UK ever to be sung entirely in Gaelic. The album Magical Ring was a huge turning point in Clannad's career, it was the start of their international career. It contained half traditional material and half original recordings. Shortly after Magical Ring, Clannad were asked to provide music for the television series Robin Of Sherwood. They once again began to stretch themselves, creating music for a range of characters and events. For the first time ever, they produced an album without any of their native Irish, as the story was set deep in English folklore. Legend (1984) won the band a BAFTA award, the first time an Irish act had been honoured thus. The musical style of the album was dominated by guitar riffs and trumpet reverberations. Songs such as "Now Is Here" stood as testament that Clannad could produce mellow and delicate tracks alongside tempestuous and piercing songs such as "Battles". Macalla (echo in Irish) was released in 1986, Clannad's most critically acclaimed album ever. It contained all original material except one traditional song and yielded the group a hit single "In A Lifetime", a duet with U2's Bono. The album opens with the song "Caisleán Óir", its haunting Irish lyrics and earthy mood has helped define Clannad's sound as overwhelmingly ethereal. In "Buachaill Ón Éirne" they took a traditional Irish song from their native Donegal and handled it with great tenderness and understatedness. It was the first time ever such a song featured on a chart-topping comercial album, something Clannad went on to pioneer in. The following album, Sirius, released in 1988, was recorded in Los Angeles with rock producers Greg Ladanyi and Russ Kunkel. Therefore it became clear that it was going to be Clannad's most adventurous project yet. The title track was Pól Brennan's encouraging call to the environmental movement, and to the Greenpeace ship of the same name. One of the more successful songs from the album was "Something To Believe In", another meditation on life's dark moments. Received with critical apprehension, Sirius was initially, stoutly defended by the band as a change, but since the members have expressed their disappointment with the album and even Pól Brennan apologised on its behalf. Despite this, the following year they embarked on their first world tour and within a year the album had become their best selling work to date. Between 1988 and 1991 there were some side projects for the band, including Atlantic Realm (1989), a small album made for a BBC documentary about the Atlantic Ocean, and The Angel and the Soldier (1990), a half hour animation, without voice overs and the music told the story. Both albums proved to be a minor success, and also demonstrated once again that Clannad were one of the most acclaimed soundtrack artists in the music industry. Also, two greatest hits albums were released at around this time: Past Present, which to date is the only "greatest hits" compilation so far by the band to include any original tracks, and The Collection, which also included five earlier tracks from their more traditional Irish period. 1991's Anam marked a return to the Clannad sound of such albums as Magical Ring and Fuaim and was recorded in just two and a half months at the band's home studio in the hills of Dublin. Anam means "Soul" in Irish and the album's 10 songs showed the usual blending of their traditional roots, their rockier later-period and their ethereal sound. Released in 1994, Banba became Clannad's 13th studio album and was greeted with rave reviews and the band's first Grammy nomination. The album jogged comfortably to the number one spot in the World Music Chart. 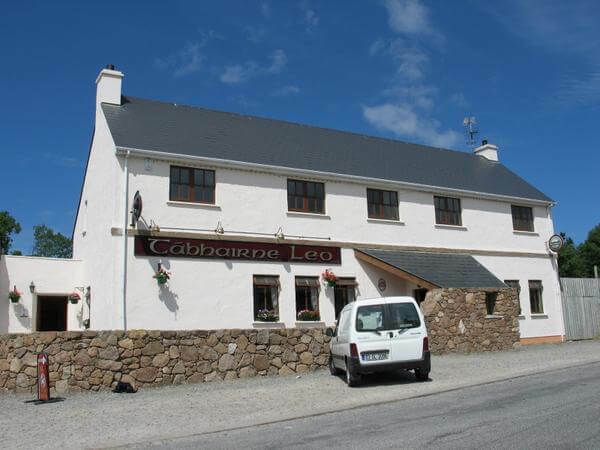 Banba is a romantic mythical name for Ireland. The track "I Will Find You" was especially written for the film The Last of the Mohicans, Máire sings in Mohican and Cherokee. Moya Brennan described the album as "a fusion of various styles of music, growing out of a traditional Gaelic root". Banba has been described as one of Clannad's most visual albums, and has sold over 1 million copies to date. Lore (1996) gave some thought to the Native American Indians. On "Trail of Tears", Noel Duggan imagines how it felt to be exiled from one's ancestral land, he was also thinking about these people and their connection with the Irish. It opens with the haunting "Croí Cróga" ("braveheart" in English) which was written as a theme tune for the Mel Gibson film of the same name but which, for unknown reasons, never made it onto the soundtrack. Lore contained a strong jazz element, with songs such as "Seanchas" displaying their unique talent at blending various contemporary sounds with traditional Irish music and the Irish language. After 25 years of recording ground-breaking music, Clannad returned in 1997 with another all round successful album, Landmarks. The record, was sited in the heartland of Donegal, shaped by the mountains, the glens and the sea-lashed shores of Gweedore. In the song "Of This Land", Máire sings about Ireland, of its past and of its future. The track "Fadó" (translates as Long Ago), demonstrates the influences of old Celtic history on Clannad's music. It won a Grammy award for Best New Age Album, Clannad's third Grammy nomination. Amazon.com has images, music samples and great prices for Clannad.